Holy Crap, We’re Doing THIS Again?!?! I have been missing in action for quite a while and this summer has been super crazy! You know how people always say, “God doesn’t give you more than you can handle”? Well, I am starting to learn that God thinks I am quite the badass! I had planned on starting a new job as a bus driver for our school district. The more J and I discussed it, we realized that it was not going to be as beneficial as we originally thought and it would put more stress on the whole family. (My intentions to go back to work were supposed to have the opposite effect.) Many factors went into the decision for me to ultimately stay home for now but one of the biggest was cost of daycare. What people and companies charge for child care are OUTRAGEOUS!! Yes, I want my children to be well taken care of but yeesh!!! Now, to understand what has been going on lately, I have to take it back a while. Something that no one talks about much happened to us early last year. We had a miscarriage and I was devastated to say the least. I never thought it would happen to me and frankly it hadn’t crossed my mind with it being my third pregnancy. But it did happen. After that, we decided to be content with our 2 healthy, happy, beautiful boys and to look forward to the future as our family of 4. As part of my self-imposed therapy, I donated all the baby clothes, sheets, bouncer, crib, rocker, maternity clothes. I needed to know that it would all go to growing families who could use the help. I don’t think I will ever get over what happened but I am in a different place in my life where I know that it happened for a reason. This miscarriage led to weight gain and anxiety and it was hard to get out of that rut that I was in. That was when I chose fight. I needed to be a better wife and mommy for my family. This spring and summer, I started eating better, exercising and walking daily and taking my vitamins. I was determined to feel better about myself physically and to hopefully lose weight in the progress. This, I believe, was the catalyst in our latest endeavour. Mid-summer, I had been having aches and pains here and there. I was working out a lot so I didn’t think much of it. I always used mowing the lawn as an aerobic activity and looked forward to it each week. There was one day when I could barely get through 1/4 of the front lawn because I was so tired and out of breath. I had had a busy morning and hadn’t eaten breakfast. I attributed the fatigue to lack of fuel. Then I realized that I was taking the last row of those birth control pills and I still hadn’t had that monthly visitor. My doctor had mentioned that some people will skip cycles altogether so I wasn’t that worried. A few days later, I was talking to J on the phone and I mentioned that I was having this one particular pain in my hip but I hadn’t felt it in quite some time. The longer I thought about it, I knew it was a familiar pain but I couldn’t quite put my finger on it. Then it hit me like a brick wall. I get this same pain in the early days of pregnancy! I have done this 3 times already, you would think I would have caught on faster!! At the same time, I have been taking the pill faithfully since the miscarriage. My alarm was set on my phone and I took it at the same time every day, I never took antibiotics. The chances of pregnancy are so low, I have a 0.1% chance of getting pregnant. Just to be sure, I packed up the kids and ran to the store…quickly! It is a pretty straight shot from the entrance of Kroger to the area with pregnancy tests but anyone who goes shopping with kids knows it is more difficult than that! My boys know that every time we go to Kroger, We need to get a free cookie from the bakery. And they insisted on getting some snacks. And I remembered I needed a couple ingredients for dinner! After getting everything else I needed, I finally picked up the pregnancy tests, yes, testS. I was going to be sure so I bought 3! Back at home, I turned on Netflix so the kiddos had something to occupy them, gave them some snacks and ran to the bathroom. The tests tell you to wait a couple minutes for it to be accurate before you look. yea…right! I was staring at that thing not really sure what I wanted out of the results. Heart racing, after about 30 seconds, you better believe there were 2 little pink lines staring right back at me. In true nature of having a 4 year old, I hear a knock on the door. L was outside the bathroom door, “Whataya doin’? I gotta go potty!” I brush away the tears. Tears of excitement, happiness, anxiety, fear. Tears of holy-crap-we’re-going-to-do-this-again! I just had to wait until J came home to tell him. I am now 14 weeks pregnant. 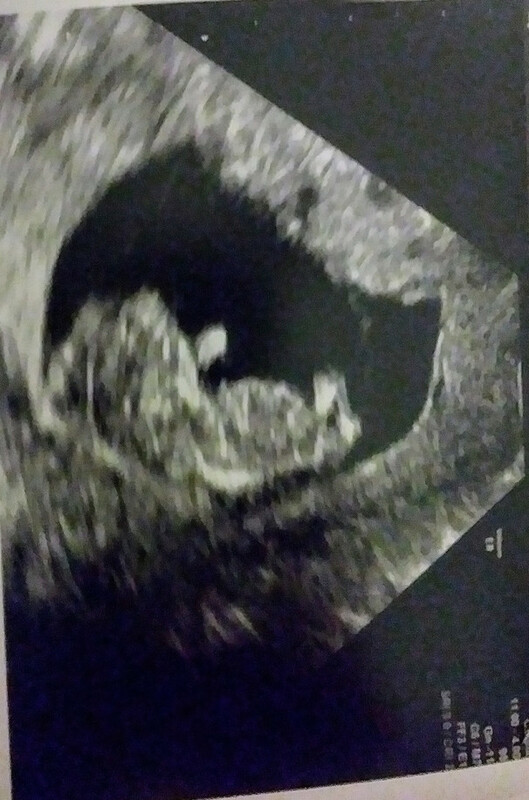 After the shock and complete surprise of finding out, we are feeling so blessed. My boys are thrilled to have a new baby brother or sister on the way. We are working on getting everything we will need for the little munchkin since I donated everything last year. We are getting things done little by little to make sure we are ready for our newest addition. My latest project: repainting and preparing the room for the boys to move in together. Keep a look out for the next post where I (I say I like J isn’t doing most of the work! Ha!!) do a complete makeover of D’s room! Have a great day and don’t forget to spread a little kindness to one another too! Previous What is with the Eyebrows?